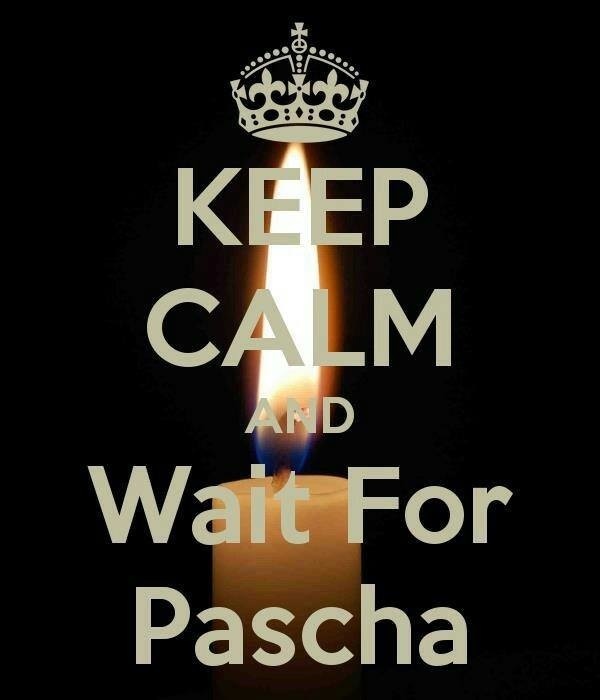 I’m all about planning for Pascha this year. I am excited for it. 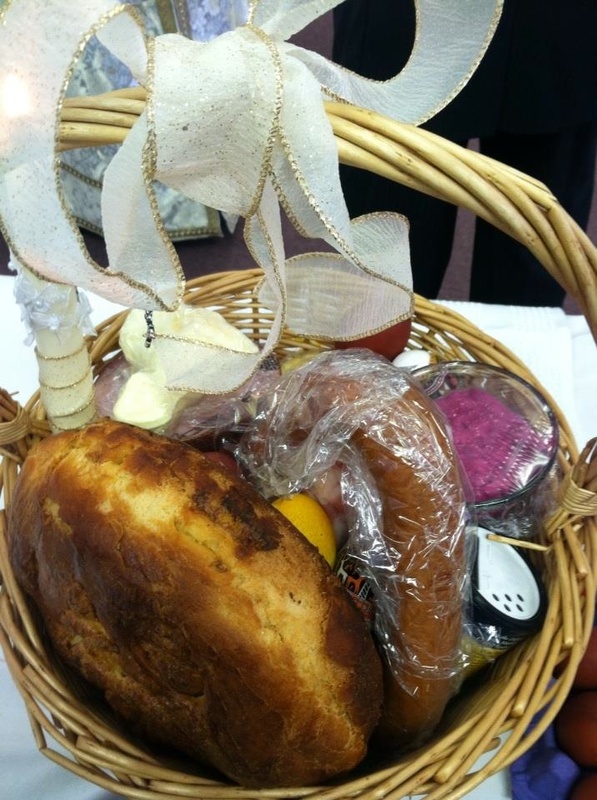 I got my basket (huge step) and my basket cover (gorgeous), my Ukrainian egg wraps, a recipe for dying eggs red (my last attempt went so-so), and a recipe for Pascha bread. I am still looking at cheese recipes! A friend is getting me authentic sausage from back east, too. I am hoping to get it all together soon. There is quite a list of what you traditionally fill your baskets with in the Russian/Slavic world! I took down the last of our interior lights last night (well, okay, I directed the effort as my husband took them down!) and all of our Christmas stuff is gone; our windows look naked! I laughed because we feel like spring is approaching, but we had a surprise snow storm this week that dumped 14″ on us in one night. We have a lot of snow, with more coming in the next few days. So that part of planning for Pascha is rather ironic! Ha-Ha! My kids tease me about my window “jellies.” I have them for pretty much every holiday! And I took down Christmas and up goes Easter! And when we got that snowstorm on Friday, this shot through the front window just made me smile. There is an old saying that goes something like, “Give God a laugh; tell Him your plans.” Here I am planning for spring, dealing with temps in the 40s and slushy, mushy rain, running to Pre-Sanctified Liturgy, only to come out about an hour later to a snow storm and temps down around 24-degrees! I couldn’t believe it! The drive home was so not fun! 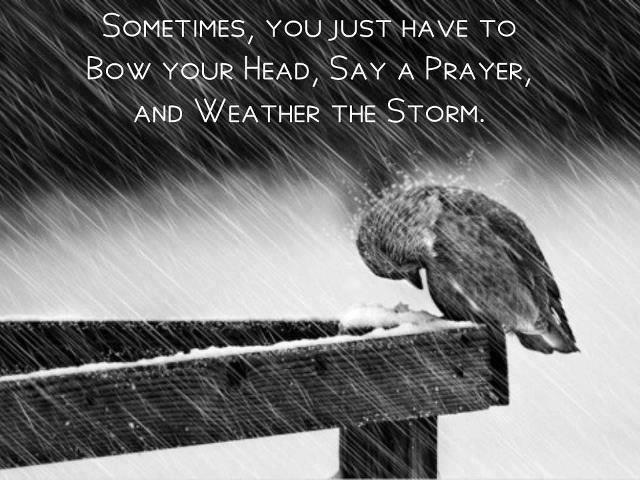 But I remembered that saying and know that God is in charge! So today, I found some recipes for dying the eggs red. 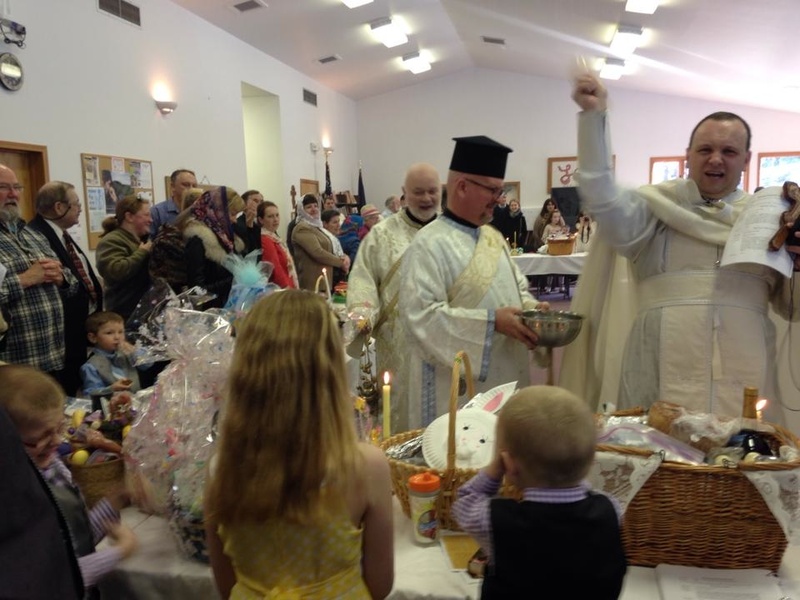 And I thought about an experience a year or two ago, when we were attending a Roman Church in WA at Easter. 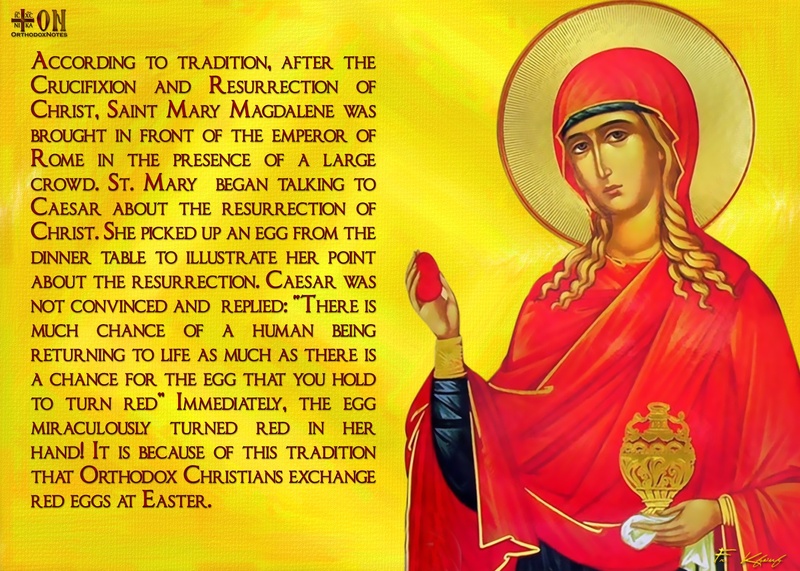 We took a basket of red eggs to share, as that had been our tradition from years past as Byzantine Catholics. No one had seen red eggs before. I laid them at the foot of the altar in a basket and people just stared at me. 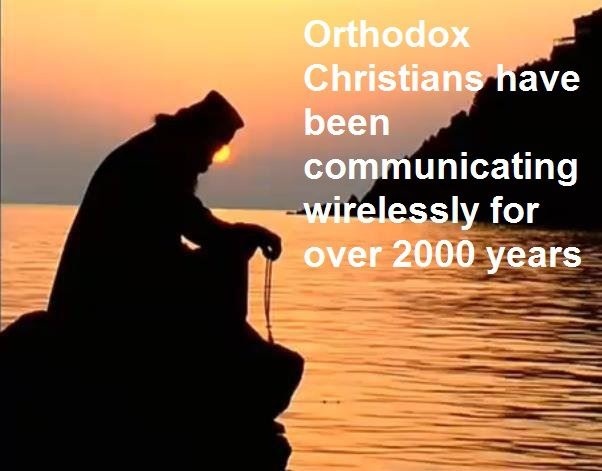 (We always stood out – my husband is a Melkite deacon and always dressed for “Mass” in his Sticharion [outer tunic] and hat, called a skoufus. We do not melt into the crowd anyway!) I had told our priest I was going to do it and he thought it was an excellent idea and gave me permission beforehand. At the donut and coffee hour afterwards, he silenced everyone and handed me a microphone, where I explained the tradition and we passed around eggs to everyone. Luckily I had made enough! But no one had ever heard the story, nor knew of the tradition. 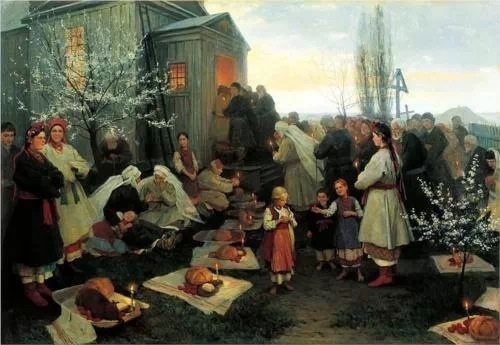 I had some elaborately decorated ones, too, in the Slavic tradition, and those were also foreign to the parish community. And it made me sad. Sad because it seems like we’re becoming a beige country. And also sad because very few people are aware of other traditions other than those egg dying kits you buy in the grocery stores! I have gone that route, with the little tablets, vinegar in bowls…the dye leaching into clothes and carpeting when you want to hide them. Naturally dyed eggs don’t run! Wrapped eggs aren’t dyed! How easy is that? And, there is so much more out there. The traditions and expressions of our faith are as diverse as the countries Christianity is found in. And it is NOT beige! No one wants to celebrate our ethnic diversity, unless of course, it is a PC ethnicity. Today there are articles abounding over the controversy of Heineken, Guinness, and Sam Adams beers pulling out of the St. Patrick’s Day Parade in New York because the parade organizers decided long ago that the parade is to honor St. Patrick and no other banners, except those honoring the Saint, can be carried. Some LGBT groups wanted to be included and wanted to carry their own banners. The organizers said they can walk in the parade, but the parade is about the Saint. Period. Which happens to be a 1st Amendment right! So, because the parade is not inclusive enough, the beer companies pulled their sponsorship. The Catholic League is calling for a boycott of those brands. 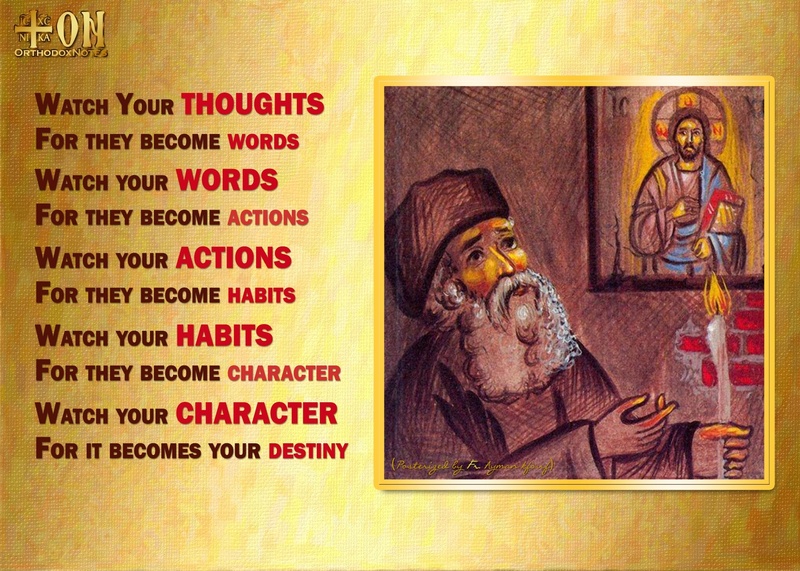 One of my favorite traditions in the Melkite Church’s celebration of Pascha is when we sing, “Christ is risen! He is truly risen!” or “Al Masiah Qaam! Haqqan Qaam! / Al Massihu Qam! Haqqan Qam!” or “Christos Anesti! Alithos Anesti!”. And we greet each other with “Glory to His Resurrection on the Third Day! 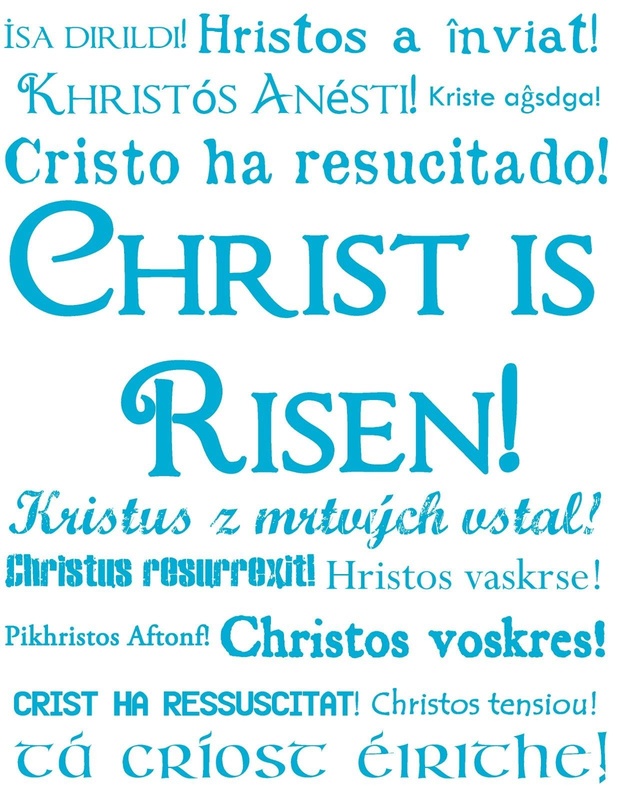 We glorify His Resurrection on the Third Day!” It becomes so loud and boisterous inside that Church – poor neighbors! 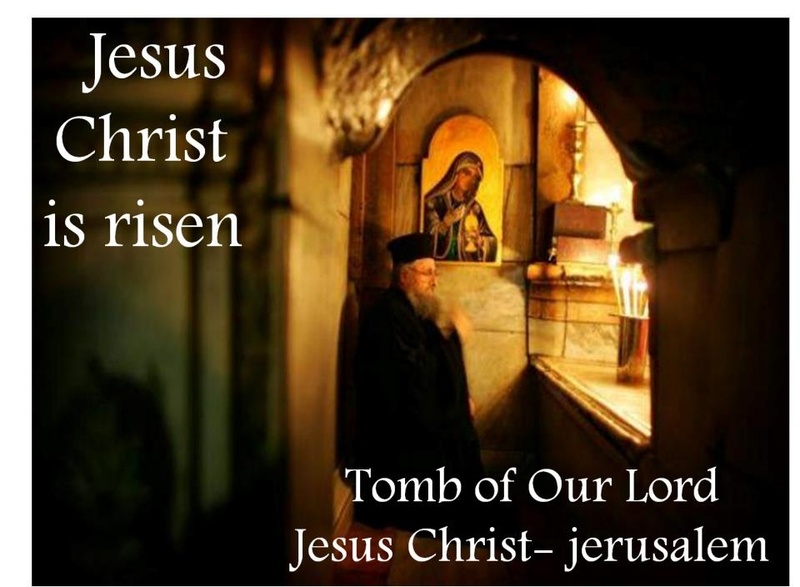 The photo above is of everyone re-entering the Church under the empty Tomb of Christ. 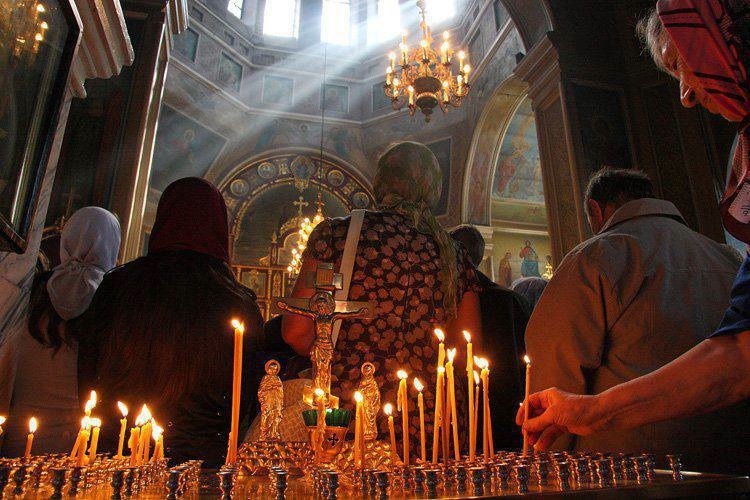 The song that then gets everyone going is, “Christ is risen from the dead and by His death He has trampled upon death, and has given life to those who are in the tombs!” Boy, you have never experienced a Pascha (Easter) Vigil until you have experienced the ones celebrated in our old parish! The lamps are swinging, it’s after 1:00 a.m., everyone is tired and their voices are hoarse, but they sing it as loud as they can, and everyone is laughing and Fr. Justin is running up and down the aisles swinging that incense! It has to be one of the most joyous experiences I have ever had. Am I Arabic? Nope! Scots/English girl here. 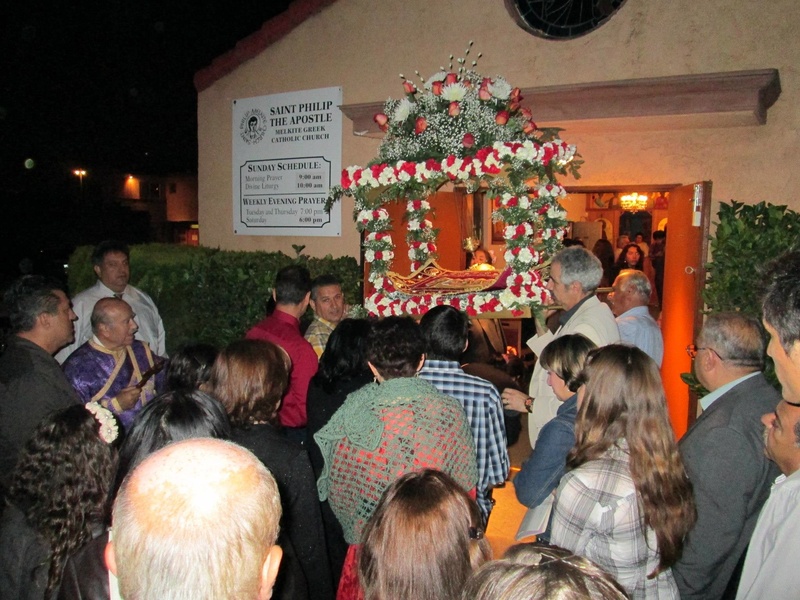 But can I embrace the spiritual, cultural, and social customs of an ethnic parish? You bet I can! I relish in it. Because to me, we are sharing what makes our Church truly universal. 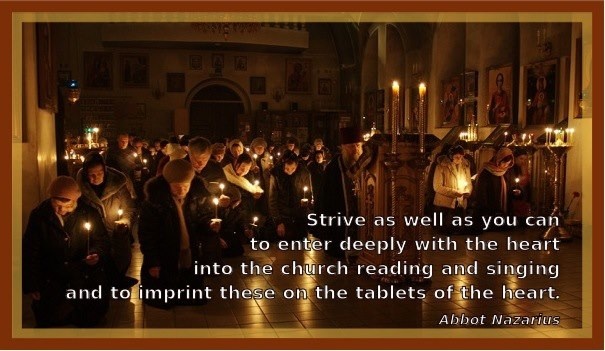 And there is absolutely nothing to compare to the Divine Liturgy of St. John Chrysostom, a midnight Easter Vigil, Fr. Justin’s exhausted enthusiasm, and the smell of MEAT cooking just yards away – a smell no incense can wipe out after 40 days of fasting; trust me on that. 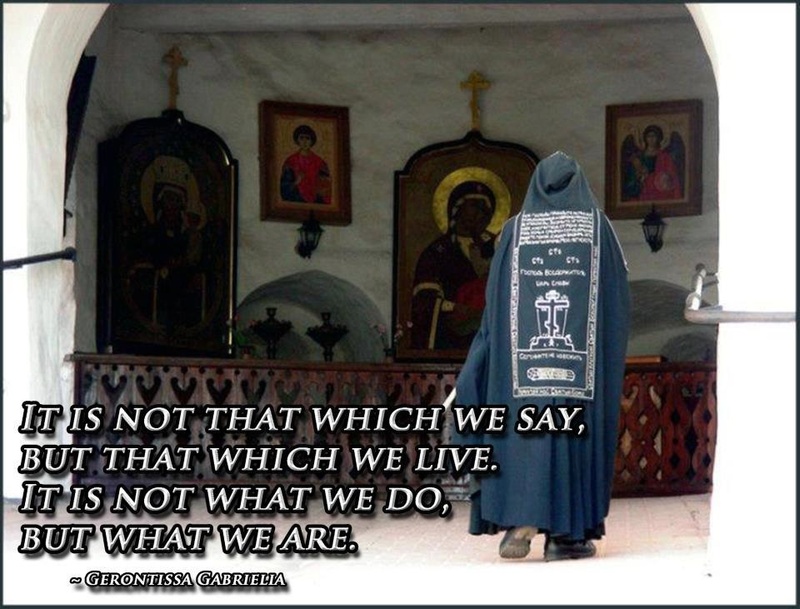 So this year, our first year up here in Alaska, celebrating in a Byzantine parish, I am learning all new traditions. And I am loving it. Why? Because my world just expanded again. I didn’t boycott because they don’t use Melkite chant or the Arabic and Greek languages, nor fast in exactly the same way. I am, instead, learning some Slavonic and trying hard to wrap my head around some Russian. I am not leaving one behind and embracing one in its place, I am adding to my religious experience; my repertoire, if you will. This process of Theosis, or my salvation, is a long one. 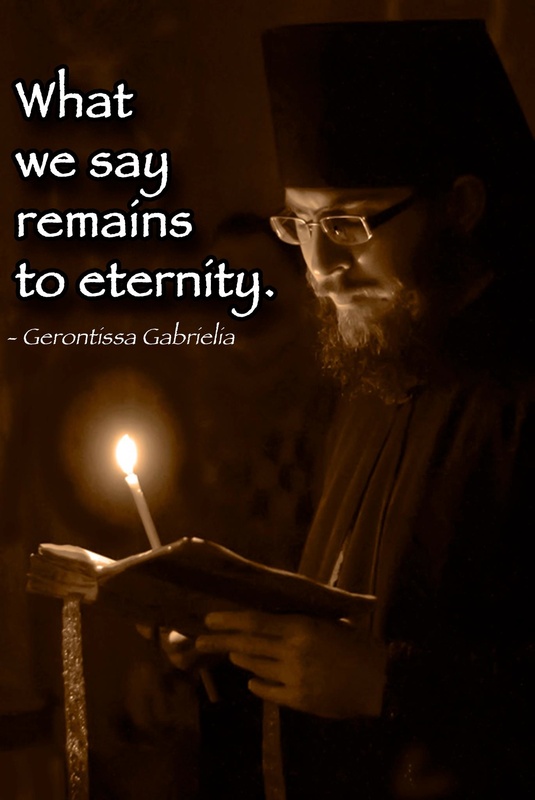 It will take my eternity! God will take us on some wild rides in our journey, if we allow it to happen. I may not celebrate wearing all green today, nor will I be breaking my fast with corned beef, but I sure can support those who do. 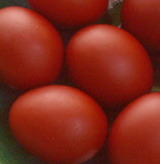 The tradition of red eggs at Easter is explained above. When two Christians greet one another at Easter, it is with an egg held in their hand (preferably hard boiled and colored/decorated!). 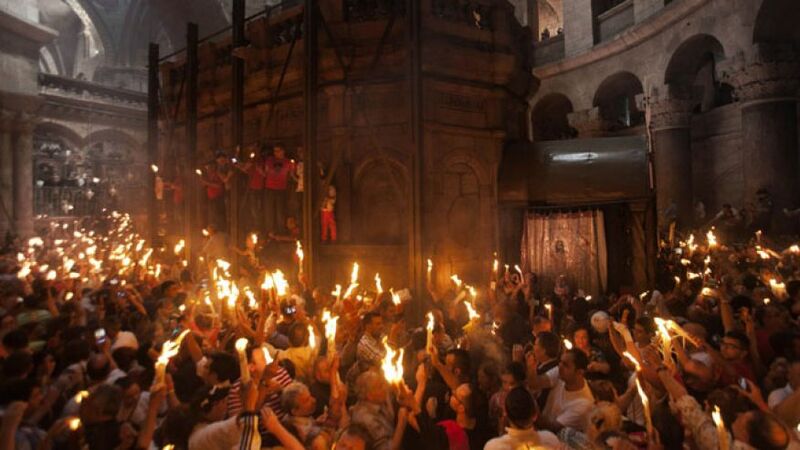 They clang eggs, symbolizing the opening of the Tomb, and they say to one another, “Christ is risen! He is truly risen!” (The one whose egg does not break is considered the “winner” and goes on, cracking eggs with others in greeting until their egg is broken. Then they eat that one and get another one!) I think sharing something with people that comes from another culture makes us better; it makes our faith more universal, or catholic. And God came for all peoples, in all places, not just a select few. He came for me! And I am getting excited! Next try is dying eggs using yellow onion skins…I’ll let you know how they come out!! I am learning patience in a completely new way and I think I like it. I was raised in a place where we took the sun for granted. It was just always there. You could look up and always see it. The seasons barely manifested themselves. We would get a slight turning of the leaves when fall would approach, and then we’d get rain. But I remember many a Christmas wearing shorts because it was so hot. I also recall Halloweens when we did not want to wear a costume because we’d sweat to death. And I also recall many, many hot, sweltering days during the summertime when even the air conditioning could not keep up with the heat. I also remember cold mornings with fog during the summertime. I remember walking to the rec center with my brother and we’d have on shorts but would also be wearing sweaters because it was foggy and cold. But by the time we walked home again, it would be so hot that the pavement felt hot beneath our shoes. And the sun was always with us. Always. Even during the shorter days of winter we had sunny and hot days. As I have moved north, I have come to experience the sun in such different ways. I just never realized how different the days could be, or how different seasons can be. And I must say, people who live in the more “warm, always sunny” climates are missing out on some beautiful days. When we lived in the greater Seattle area, I experienced the oddest thing. I experienced blowing leaves and rain that were both coming down so hard, the wiper blades got stuck. I had to get out of my car in the wind, rain, and blowing leaves to unclog the blades so I could see where I was going. It was truly a fall experience. The leaves were a cornucopia of golds and reds, yellows and oranges. It was glorious! And shorter days really became shorter days. It would be pitch black at 5:00pm! And the smell of fall…it is so hard to describe, but it was simply glorious. I also never really understood all that decorating in fall colors, the different styles of gourds (pumpkins are just 1 of zillions) and the drinking of hot beverages, until I lived in the Pacific Northwest! I think fall became my favorite time of year when we lived in Washington State. And it holds a special place in my heart. I will ever miss and long for those fall days in Maple Valley. And now I live in the “far north,” the farthest north you can live and still be in America. It’s the home of the Iditarod and mushing, snow machining and ice fishing. It is called the “Land of the Midnight Sun” because during the summertime, we have very little dark. The oddest thing for me was taking my husband to the airport at 2:00am and not needing headlights. Perfectly light outside. On my way home, about 3:00am, I put on my head lights. And the other half of that saying is that it is the “Land of the Midnight Sun for three months, then the land of no sun.” And that is where I am today. We are in Lent. 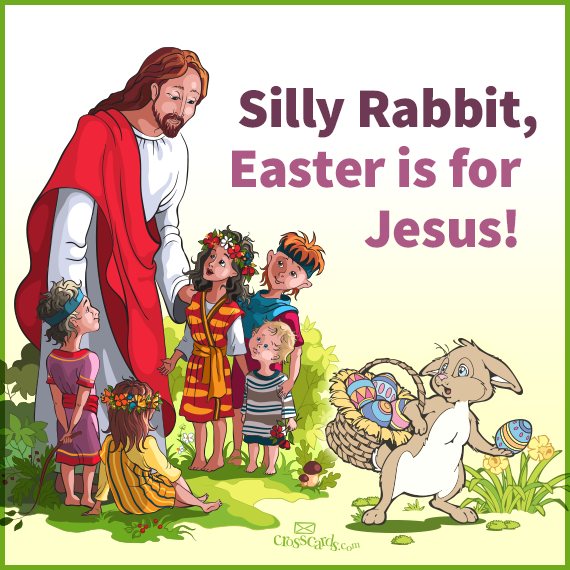 At the end of Lent we have Easter. Typically Easter means Spring. It is also characterized by bright colors, flowers, and cute Easter dresses for girls, Easter bonnets, baskets, and little bunnies. All bright pinks, yellows, greens, and blues! Did I tell you have I grandchildren? Easter shopping for them is just so much fun! Except that up here, it is still winter. Today we have wind just howling against our house, shaking the little “Welcome to our Home” sign I recently got on clearance at Michael’s Craft Store (and which I am seriously thinking of taking down for awhile – it rattles against the house. Maybe that’s why it was on clearance!!!) and our combo screen/glass door rattling so that it sounds like someone is coming inside the house – which the dogs think they need to bark about and the cat needs to scurry away and hide from. We have snow in our forecast for today and tomorrow, as well as next week. It is a whopping 27-degrees outside right now. And we are preparing for Easter. 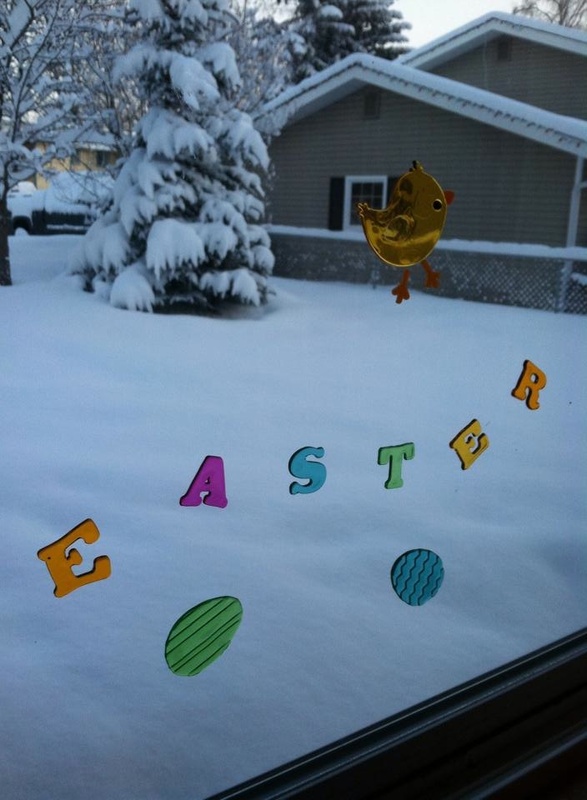 I put my little jelly clings on my windows, all eggs and “Happy Easter,” yesterday and it was blowing snow. It is just such a difference from what I have ever experienced in life. In Washington, the tulips were coming up by now! In California, it was already shorts and flip-flops, iced tea and A/C weather!! But here, no here, it is still winter. And it’s still Lent! 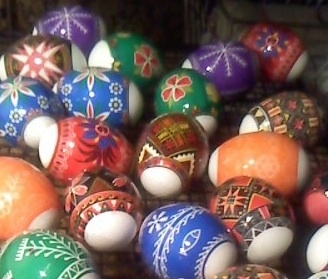 I am planning our family Easter Basket in the Slavic tradition and have plans for making lamb butter (just a mold – not made out of a lamb) and cheese, getting some real German sausage, coloring my eggs (I even got some awesome Ukrainian egg wraps), and making a bow for it. 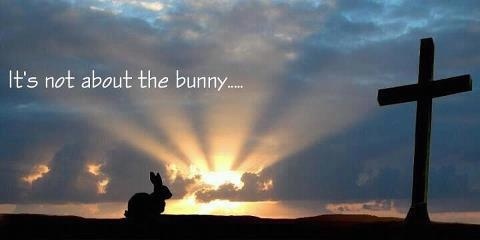 And it is hard, trying to get excited about Easter, when it is all dark and gloomy. And it’s still Lent. And I feel so guilty that I cannot even “stay awake” with the Lord. He has asked us to pray with Him, to keep watch with Him. Our watch with Him is Lent. He has asked us to help Him when His heart was so distressed, knowing what was facing Him. He wanted those who loved Him to be at His side. Christ, being also God, knew what was in the hearts of the three He had with Him. He even commented that He knew their “flesh is weak,” which I take to mean that God knows our trials are hard, but we are fleshy-humans with weak wills that succumb to our bodily weaknesses. The Apostles didn’t truly understand what Christ was about to go through, or I am sure their fear would have kept them wide awake. I always found it interesting that the deceit of Judas came in the dark, as most evil intentions do. And here I am, living in a land with so much of the year in darkness. The land struggles to find its way to Spring, just as we struggle to find our way through Lent. From the darkness to the light. From the Fast to the Feast. 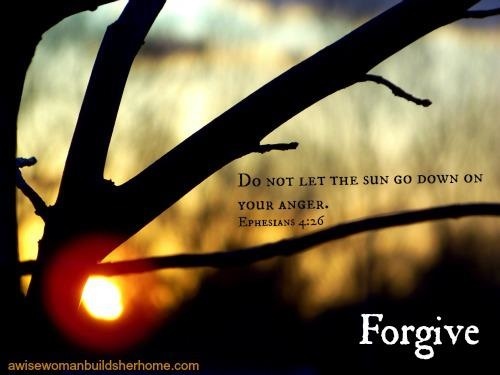 From floundering with ourselves, to the Light of Christ in our lives. We all have demons and we all struggle with them. Our culture does not help us to tame our demons; it is a hedonistic society in which we live, in which esoteric struggles are met with “If it feels good, do it,” and other slogans. The idea of self-sacrifice is so foreign to most people. People of faith, however, are more used to models of sacrifice; the ultimate model of self-sacrifice is Christ on Our Cross. Because let’s not fool ourselves! Christ died for me. He came into this world to save sinners…and that is me. Christ would have sacrificed Himself had I been the only soul on earth. Because God deemed it right! “For God so loved the world that He gave His only begotten Son, that whoever believes in Him should not perish but have everlasting life.” (John 3:16). Christ came to save us, but we need to remember that He came to save ME. It makes all of this far more personal, and salvation is, indeed, very personal. We, each of us, has to come to a personal knowledge and thanksgiving for the sacrifice of Christ on the Cross…and that cross has each of our names on it. Each time that hammer pounded on His Flesh, it was for ME. Each time His skin was torn through His Flagellation at the hands of the soldiers, it was torn for ME – it was torn BECAUSE OF ME. Each of us can personally share in the sacrifice of Christ, and each of us bears responsibility for that sacrifice. 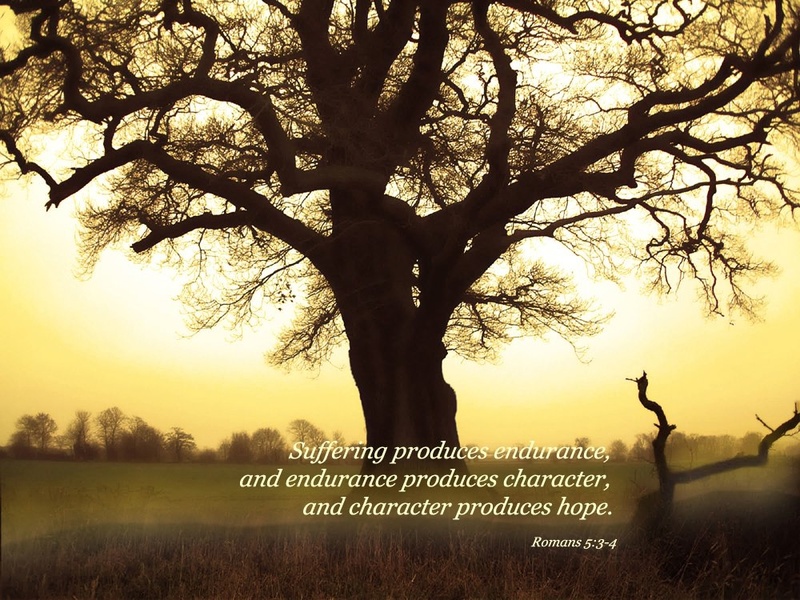 What helps bring the Spring, and allow the Light of Christ to shine, is how we corporately prepare and corporately celebrate this Gift from God – our salvation. We prepare together and hold each other up as we go out to meet the demons and the angels. We mourn together during Holy Week as we walk, once again, along that Way of the Cross with a beaten and battered Lord Who willingly gave His life for each of us. And when the clouds passed over His Cross, when the Temple’s cloth was torn asunder, and the sun shone brightly, we hold our collective breath. 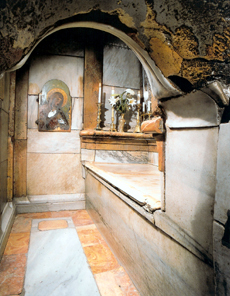 As Our Lord is lowered from our Cross and laid in His tomb, we wait, breathless, for the sun to shine. For that moment when He rises past all of it, to appear in Glory. I believe that our passing through all these dark days, when we long for Spring and some warm weather, is the perfect time for Lent. It is amazing how much the sun can change how you look at everything. A couple of sunny days in a row and I am ready to redecorate! I want to paint and pull all the stuff off the walls and scrub! I want the light to come into a clean place. And I get all excited. And that is also the process of Lent. We pray. We sacrifice. We live in the darkness, just waiting for the snow to melt around our hearts and the sun (Son) to shine in all the dark places we’ve allowed to go untouched for far too long. And we can all feel it coming closer. We start to see that light far off. Occasionally the Church gives us a Feast Day in amongst all the fasting, and we get a glimpse of the full sunshine that is coming. And I will do so with a preparatory heart, knowing that: Blessed Lent! There is a synergy at work in the world, and sometimes I just marvel at it. There are times when meeting new people, or just hanging with people you know, that some other odd connection pops up. It makes the world seem smaller, and less daunting, somehow. I saw a posting on Facebook today where all these people were opining and it was so fun to see disparate people, who I know do not know one another, chat and yet, I know both of them. It was pretty neat because they live on opposite sides of the country, and still found common ground, and I was able to witness that. I had nothing to do with it, either, I just happened upon it. I think that is so awesome. I was reading about some guy on a reality show tweeting something that people found offensive. He made a couple of statements about how the “US is a great place to live, but you need to know there is a lot more out there.” And with all that is going on in Ukraine, with Russia, and our part in Afghanistan, with Britain giving its input, and stories out of South America, stories of things happening in Africa, it does seem like the world is smaller these days. When my kids were traveling from Hawaii back to Alaska, we were talking about the long flight (with a 4-month old and 2-year old, and a husband on crutches, it was LONG) between the two places. But imagine going on “vacation” where you had to travel by boat? From Alaska to Hawaii? Days and weeks, not hours. When my parents immigrated to the USA, they came via steamer from New Zealand. It took weeks and weeks. And I remember as a child, we had to schedule, in advance, a phone call with my grandparents in New Zealand, to talk on Christmas Day, from California. There was only one cable linking the two places, and phone calls were very limited. We only spoke briefly, and rarely, to my grandparents. They received some news, fashion, and the latest technology usually a year or two behind us. We were separated by an ocean. Much the same was happening to my husband’s family still living in Russia, and with his family here. The only conversation allowed was by letter, and that was spotty, at best. Technology has changed all of that. We are now smaller, and closer, and more quickly connected than ever before. We are now completing our first full week of Lent. 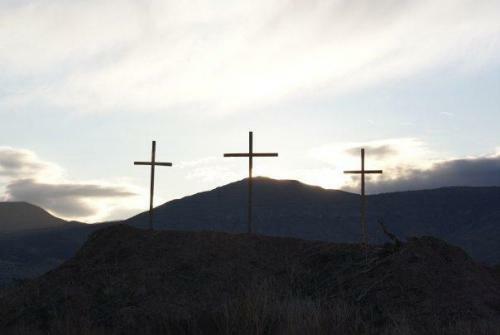 And God continues to move across His landscape. I’ve seen some amazing sunrises lately, and I’ve seen some beautiful sites in our little world up here. I’ve gazed into the face of my adorable grand daughter, and seen a priceless smile as she gains my eyes and recognizes me. My grandson’s unfiltered laughter just makes my heart sing. Watching my granddaughter on a video on my phone (she lives far away) smiling and laughing into a toy phone (that’s my girl!!). These are precious moments captured for me, that show the goodness we have in our lives…and the overabundance of Grace working in them. There is so much to be grateful for, and difficulty (all on our side) of receiving that gift from God seems ridiculously easy…just faith in God. So simple. So uncomplicated. And yet we buck conformity to religion all the time. God left us His will in His Apostles, and His Tradition was exercised in His Church for 100s of years before we even had a Bible. We trust in all of it because trust is part of believing. The Book of Hebrews, chapter 11, talks about the faith: Now faith is confidence in what we hope for and assurance about what we do not see. 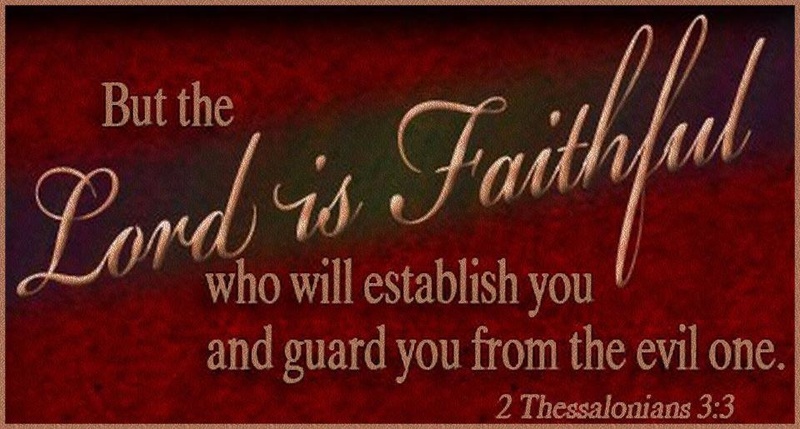 (Hebrews 11:1) It goes on and on, telling us what we believe is based on faith and trust in God. So many examples from Abel and Abraham, to Isaac and Moses – the faith we were given goes back 1000s of years, to the beginning of time, itself. In her wisdom, the Church has asked us to focus these 40 days on our faith. Today I saw that faith revealed in such simple ways. It is amazing what you see when you take the time to focus. 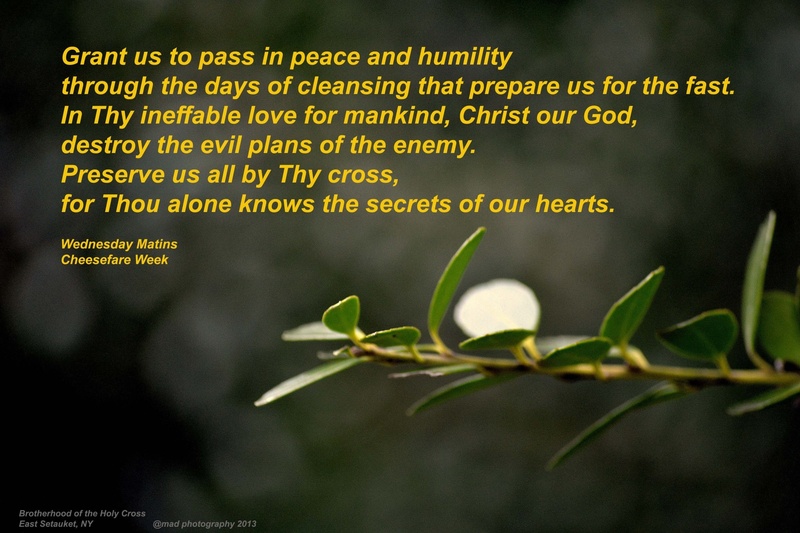 Blessings on our continued Lenten journey…. I am thinking about family today. Two years ago today (2012) my father-in-law (memory eternal) passed away, with my husband and middle son sitting at his side. It was a very sad event for all of us, because he was relatively young and the disease of cancer took him so very quickly. It was important to my eldest son and his wife that they be there, to introduce their newborn son to his great-grandpa, even if it was on his deathbed. It was a transcendent moment in so many ways. I remember about 28 years ago when my son, around the same age, was sitting with his great-grandfather as he lay dying. And it was repeated a generation later. We mourn the loss of my father-in-law today; my husband most especially. But my sons feel the loss deeply, as their grandpa was such a big part of their childhood and growing up. We have so many wonderful memories spent together as a family. Memory eternal, Joe. In today’s reading, Christ speaks to the women who are following Him on his way to the Cross. “Daughters of Jerusalem, weep not for me; weep instead for your children, for indeed the days are coming when people will say, ‘Blessed are the barren, the wombs that never bore and the breasts that never nursed. '” (Luke 29:28-30) Today, as I was contemplating our family and our losses, when I read this, I also mourned all the children we have lost to miscarriage (there are seven in all). As I lamented the loss of my babies, I also feel blessed for not having a lot of children. That sounds odd, but being barren for most of my marriage has given me a heart for other women who cannot have children; a heart for those who have lost children in miscarriage as I have; a heart to adopt (which we did); and a heart for those mothers who lose their children later in life, and who go before their parents (disease, accident, war). It is difficult to comfort a mother who grieves the loss of a child. 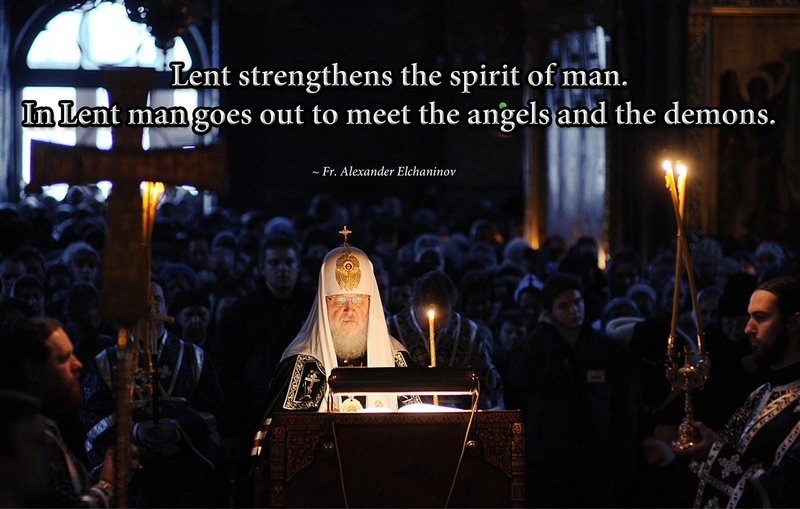 Great Lent is just about upon us. For me, Lent is a time when I come into a more simple, basic relationship with God. And for me, that works best when I strip away things that keep me from focusing my attention on God. During Lent, I work extra-hard on taking down those things that place a sort of blockade between me and God. The Church has us focus on food during Lent – why? Some far better bloggers than I am have tackled that today. What I took from them is that food is our original passion: Adam and that darn apple. What we choose to consume feeds a baser desire within us. Food and eating is an intimate act for a person. We have desires for food and quite often we are unable to separate our desires for satisfaction in our lives for satisfaction with eating habits. I am overweight, and for me, that means I have issues somewhere within myself that cause me to turn to food, when I should turn to something else, like prayer. So for me, Lent is an opportunity to tame a disordered part of my life and bring it into order. I try to really fast. This year my husband and I are digging in our heels and being stubborn. Last night he chose to not get dessert for the family while at the grocery store. A small, fasting-led, victory over our base-passions. (We will take all the victories we can get!). During Lent, we are also asked to participate more fully in the life of the Church. We will be dedicating ourselves to attending as many prayer-evenings, parish functions, and community get-togethers as we can. We are also dedicated to simplifying the technology in our lives. Not as much TV, computers, music, iPods, and iPhones. We will be substituting spiritual reading in place of technology; or just being together, quietly, as a family. And with all of this paring-down, cutting-back, and increased periods of quiet, I will think of those I miss of our family. I will pray for all our family members who are no longer with us; I will pray for my babies, already in heaven and waiting for me. 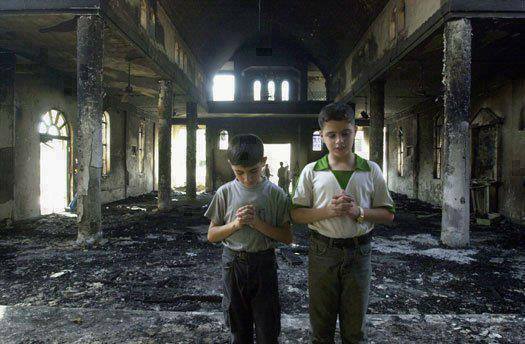 I will pray for all those lost because of war, famine, and other disasters around the globe. And in the quiet, I will pray that this is not the “final war” that is spoken of in whispers. I will pray that my daughters-in-law will not weep for their children, nor I for mine. I pray that God will grant the world a respite from all the ugliness that is encompassing it. 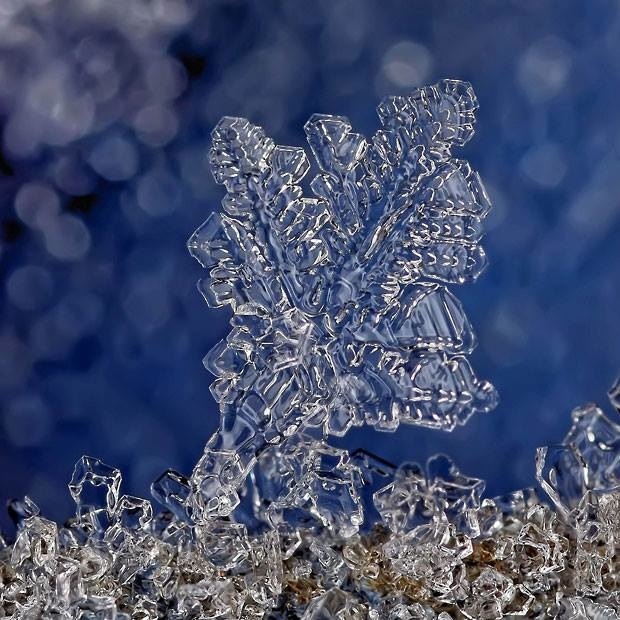 And when I see those first buds of spring flowers poke their heads over our snow-covered yard, I will once again smile. Spring itself seems like it is God’s promise of tomorrow. 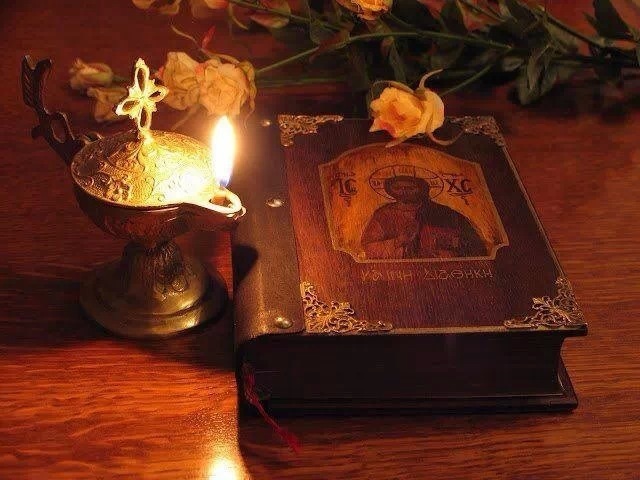 Perhaps all the quiet, the simple fare eaten, the time spent in prayer and reading, will lead me to a greater love for God and His desires in my life, because I think I can hear Him much easier in a quieter, simpler, less-cluttered life. And this year, for the first time, I am organizing and really planning our family Easter Basket. 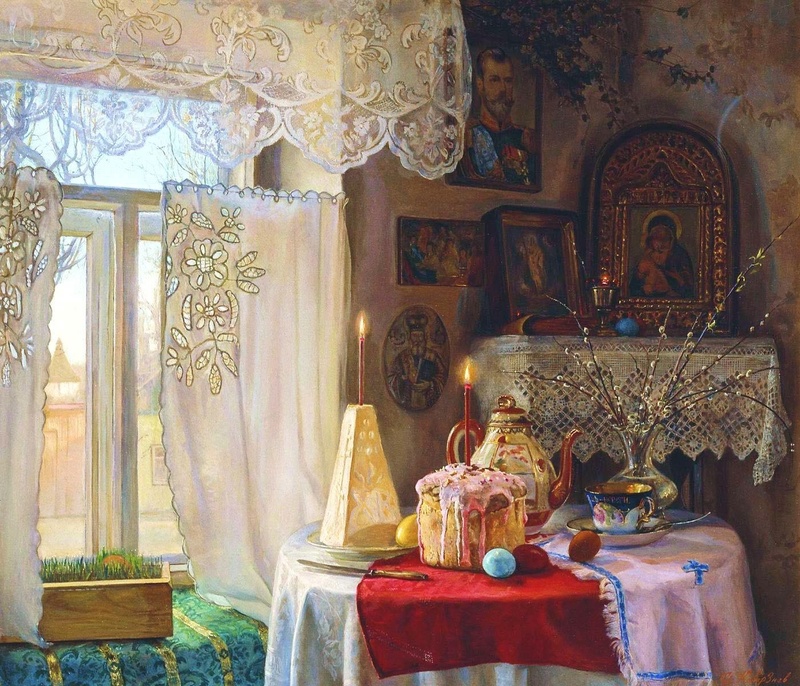 The tradition of a family basket is shown in the artwork above; a Russian village is waiting for their baskets to be blessed. We will be preparing the foods and other items to go into our basket and I am so very excited – I ordered and received our basket cover! (It is so pretty – thank you Matushka Anita, for making it for me). I am looking forward to the preparation and assembly of our basket. 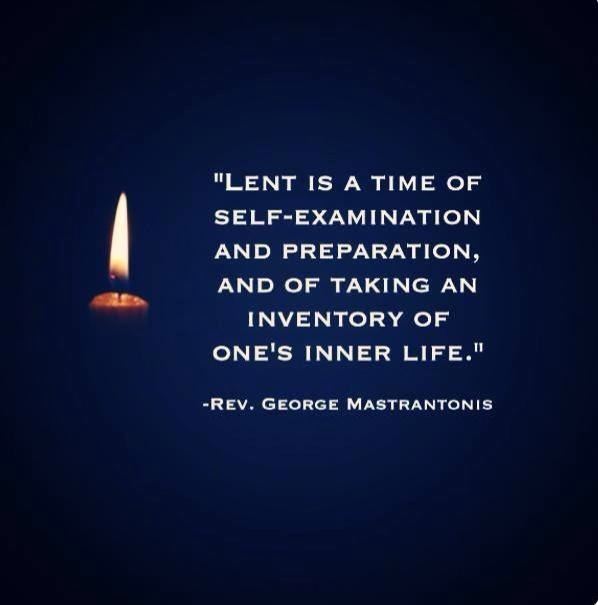 And, rather than argue about what each person does, what they eat or don’t eat, I am focusing on my own spiritual renewal and re-commitment to my faith during Lent, and the plans for a joyous Easter celebration. Perhaps there will come a day when I weep for my children, or my grandchildren: I pray that it is not in my lifetime. For me, now, there is much to look forward to, and this time of Lent is preparing us for our future, our moment of Spring and sunshine, flowers blooming and birds chirping, and a nice roast cooking for dinner! Happy Wednesday of Cheese Fare week. Memories eternal to Joe and Frank, our fathers who left us for their blessed repose.